Leaving 2013 behind, the year of the snake, I am excited to welcome 2014, the year of the white horse. Growing up with Asian folk culture meant that each new year was met with the assigned animal symbol and subsequent foretelling of what the year might bring. Personally, I like the horse much better than the snake; since childhood, I have never been able to even touch a picture of snakes! Resonating with the symbolism of the white horse — free, independent, spirited — I dare to dream of a more equal society rooted in the virtue of seeking common good. It has become so rare these days in the culture of cold-blooded excess for the few and scarcity for the majority. In fact, since the great economic meltdown, America’s middle class has been jammed into one of the most unequal economic distributions. 442 billionaires in 2013 — 17 more than 2012 — sit in their record-breaking profit of trillions. Not long ago, the New York Times reported that the airline industries cashed in an extra $200 million dollars profit annually by accommodating more luxury for the business class by increasing more rows to the coach class. As a result, the passengers in the coach class are squeezed like sardines. Last June, in an Airbus from Chicago to Berlin, even a short person like me felt my legs bumping the magazine rack in front. Next to me was a tall Caucasian woman who had to keep her legs apart just to sit. Increasingly many Americans appear to have been numbed and distracted to this widening gap. What if we envision the year 2014 as one to pursue a more equal society, represented by the symbiosis of nature? A planetary theologian, Sallie MacFague writes, “The most important services are not necessarily the most visible ones. For instance, in a forest it is not only the standing trees that are valuable but also the fallen ones (the “nurse logs” on which new trees grow)…” (Life Abundant: Rethinking Theology and Economy for a Planet in Peril, p. 91) If one applies nature’s synergistic symbiosis to human culture, the “nurse logs” could be those who work tirelessly and invisibly in a visual culture of “selfies“, Facebook, and the raw displays of excess for some that overlook the indispensable “nurse logs” of our society. What if we were to restore the value of common good that made America a thriving place? In 1 Corinthians 12, Paul summons us to practice a common good that glues all different parts to become the body of Christ: “Now to each one the manifestation of the Spirit is given for the common good” (12:7). 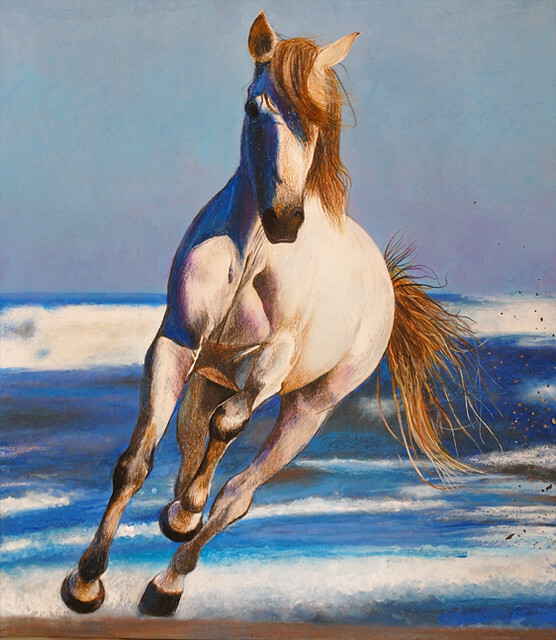 Some may question how the independent characteristic of the white horse connect with the common good. Embedded in the horse’s characteristics is also a constellation of contradictions. Synergy in the body of Christ cannot be formed among homogeneity but heterogeneity, as elaborated by Apostle Paul. In an increasingly digitalizing culture of narcissism and homogeneity aided by technology, rather than practicing synergistic values, the social phenomenon of “birds of a feather flock together” seem to fill both cyber and face-to- face spaces. For these reasons, I project all the wishes and dreams onto the year of the horse which symbolizes the energy of freedom, independence, and possibly toward interdependent synergy. Limiting the excess of the few, retrieving the value of common good may breathe a culture of synergy both in the micro and macro dimensions. In other words, through the lens of the common good, the business class would recline only to the point that allows the coach class to sit without cramming their legs. Can we choose to dismount from such an immoral race of the maximum profit for the few at the expense of the majority in the year 2014? Can we gallop toward the path of common good, a core value in the history of our nation? After all, one of the most important callings for Christians today is to be in solidarity with the nurse logs of our society as Jesus of Nazareth practiced.